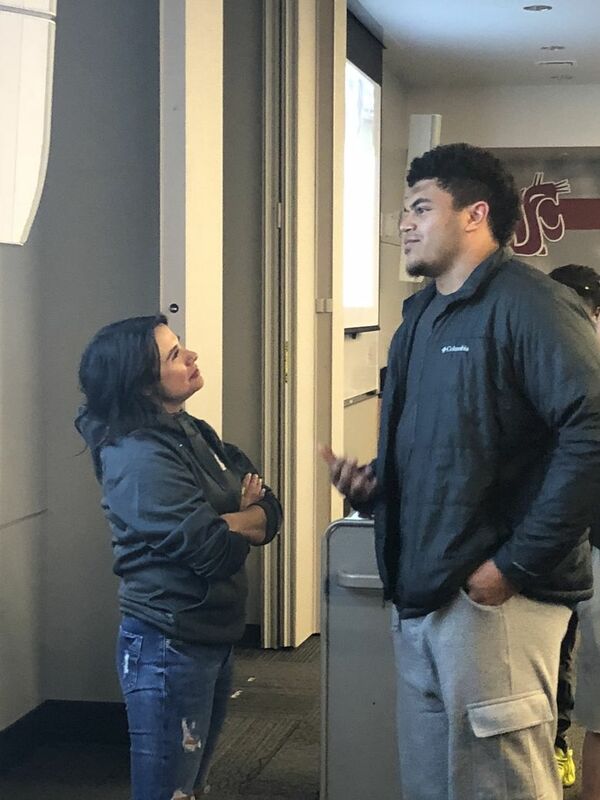 Part life coach, part domestic violence speaker, Rachel Baribeau spoke to the WSU football team Monday about how to treat women, be good citizens, embrace their own vulnerability and maximize their platforms. General Jim Mattis spoke to the Washington State football team about leadership in 2016, a few months before he was appointed Secretary of Defense. Eric Thomas, a motivational speaker and minister from Detroit, also has shared his story about going from homelessness to graduating from college with the Cougars’ football team. But speaker who stood before the WSU football team in Pullman on Monday was different from anyone they’d hosted before. For one, Rachel Baribeau is a woman, and for another, she addressed the team about moving beyond the masculine stereotypes surrounding football players, challenging them to connect with one another and contribute to society in meaningful ways. Baribeau is a sportscaster on SiriusXM Radio who, since 2016, has moonlighted as a motivational speaker on the college football circuit. Part life coach, part domestic violence speaker, Baribeau speaks to college football teams about how to treat women, be good citizens, embrace their own vulnerability and maximize their platforms. 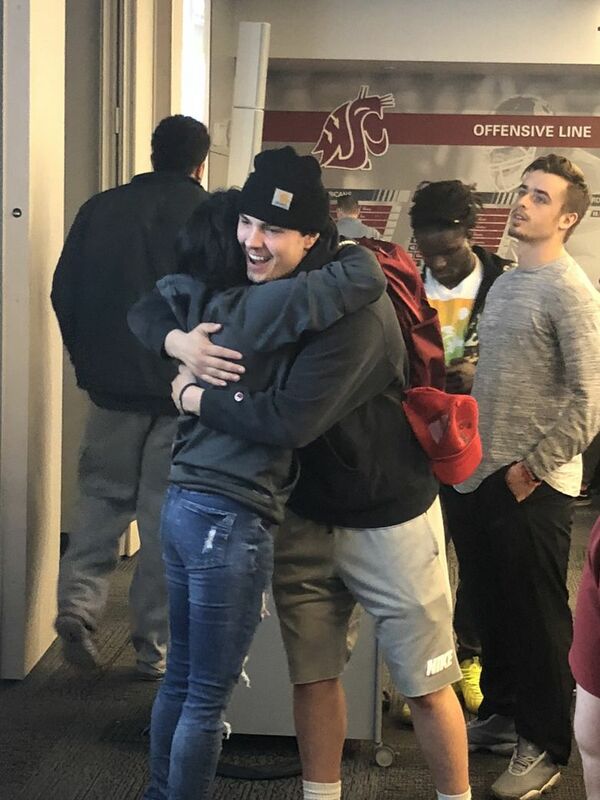 The death of WSU quarterback Tyler Hilinski in January has struck a national conversation about the importance of encouraging young men to express their emotions, and Baribeau’s trip to WSU was prompted, in part by a former high school teammate of Hilinski’s, who was touched by Baribeau’s message when she spoke at his school last fall. Tatum Slack, a junior cornerback at the University of Buffalo, played with Hilinski at Upland (Calif.) High School and was deeply moved by Baribeau’s talk in Buffalo last August. After Hilinski’s death, Slack contacted Baribeau and suggested that she speak to the grieving Cougars. Baribeau knew WSU coach Mike Leach from his brief stint as a radio host on SiriusXM. 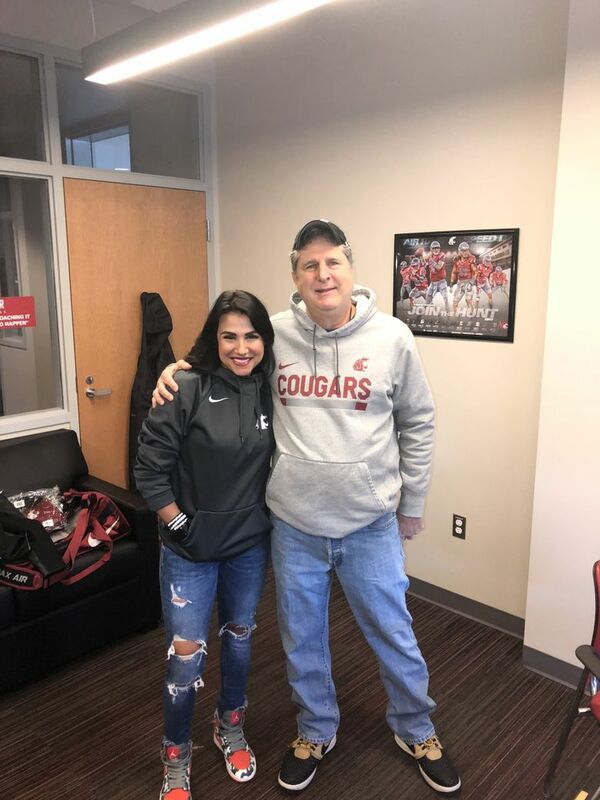 So she reached out to him offering to speak to the Cougars, and Leach enthusiastically accepted, making WSU the 24th stop on Baribeau’s “Changing the Narrative” tour of college football programs. Baribeau conceived her “Changing the Narrative” curriculum after the torrid summer of 2016 when college football was plagued by a rash of sexual assault or domestic violence cases involving players at numerous Division I programs throughout the country. Now, Baribeau goes from one college football facility to another sharing her domestic violence experience, and talking about how men should treat women and how football players can use their platforms to make an impact on their communities and effect positive change. Part of that involves teaching men to get in touch with their feelings. “I really feel like the music, popular culture and movies are giving young men the message that they don’t have to be involved, that there’s something wrong with sharing your feelings and they don’t have to tell people when they’re hurting,” Baribeau said. Baribeau tries to be a big sister to the college football players she speaks to, and her approachable nature makes the guys want to open up to her. The Cougars were no different. 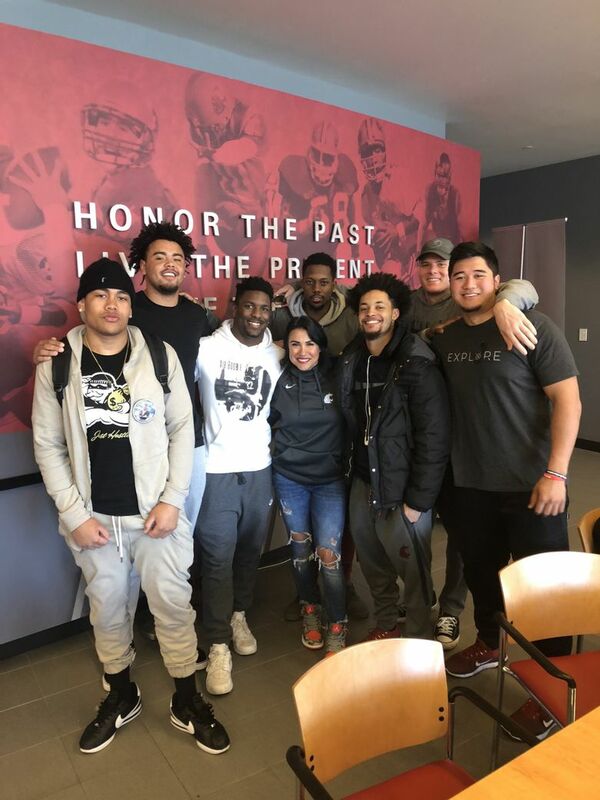 On Monday, the WSU football team paid rapt attention during Baribeau’s presentation in which she shared her experiences on different subjects, including an anecdote about how the ALS diagnosis of her friend, former Philadelphia Eagles fullback Kevin Turner, changed her life. That resonated with the Cougars because of their ties to WSU and New Orleans Saints great Steve Gleason, who was diagnosed with ALS in 2011. 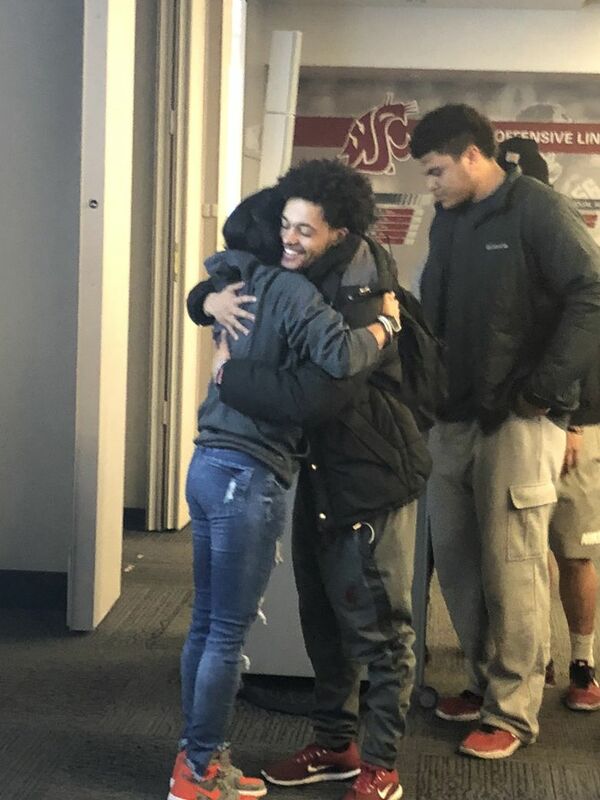 Baribeau stayed for a couple of hours after her talk, and about 30 different WSU players came up to hug her and chat about life. Two in particular struck a chord with Baribeau when they revealed they’d experienced homelessness during periods of their lives. Baribeau will return to WSU in August to announce the winner of the “Changing the Narrative Award,” which she devised and cleared with the NCAA in January. The whole team will vote on the winner – a young man who exemplifies the “Changing the Narrative” tenets of thoughtfulness, service and communication, and who treats women well and gives maximum effort. When the winner leaves school, he’ll be eligible for an endowment to help him start his own foundation. She’s also offered to train any players who want to go to high schools to share their story and teach high school athletes Baribeau’s Changing the Narrative values.